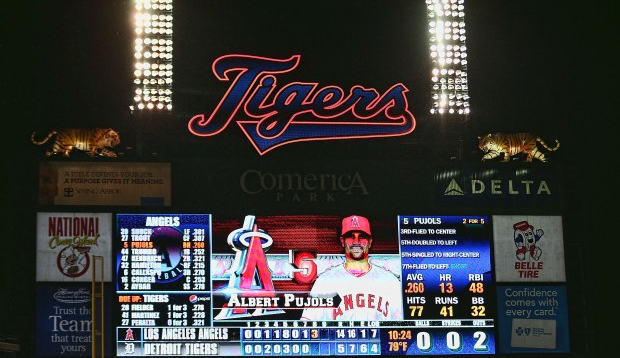 Bay of Cigs: Are the Tigers the unluckiest team in baseball? The short answer is yes, the Detroit Tigers are baseball’s unluckiest team this year. Baseball Prospectus has a semi-interactive feature called “Adjusted Standings,” which looks just like an ordinary baseball standings grid, but it has a few extra columns. I don’t pretend to understand the number crunching that’s going on behind the scenes to determine the precise contents of those extra columns, but I do understand the gist of the concept, which is to assess the relationship between a team’s outcomes and the quality of its play. Teams that play the game well usually win games. Sometimes teams play poorly but still win. Sometimes teams play well but lose. If such an incongruity persisted over the course of many games, we reasonably could say that the reason was due to good luck or bad luck. In the Tigers’ case, that chart shows that, for three different ways of measuring teams’ luck (look at columns D1, D2, and D3), no team has had worse luck than the Tigers this year. (Yes, the Cubs have been a little less lucky under D1, but across the board, it isn’t close.) Because I don’t know what goes into calculating these various expected winning percentages, I can’t really render a hypothesis on the root or location of that bad luck, although the bullpen seems like a good place to start. I think I can reasonably speculate on what this piece of information might mean, though. Just as we expect luck to “run out” on players and teams achieving better outcomes than their actual performance would indicate, so too should we expect players and teams experiencing bad luck to have their fortunes improve. With more than half of the season remaining, I am comforted by (if not presently comfortable with) the notion that, despite their record, the Tigers are playing good baseball. As much as it hurts my ulcer to watch them give away games in the late innings, I don’t think I’d prefer sitting on pins and needles waiting for the bottom to fall out, at least as far as the regular season is concerned. These Tigers are playing good baseball, and some members of this team are playing exceptional baseball. Max Scherzer is having a wonderful year and at this point deserves to be considered the ace atop one of the best starting rotations in baseball. And while Scherzer is having a career year, Miguel Cabrera is backing up an historic 2012 season with another one that might be even better. There certainly is tinkering left to be done with this team, but I can’t wait to watch them really heat up this summer. This entry was posted in ALDLAND and tagged baseball prospectus, detroit, fangraphs, max scherzer, miguel cabrera, mlb, tigers by AD. Bookmark the permalink. Nice post. Be sure to avoid the gambler’s fallacy though. It basically is the belief that if you lose a little bit [are a bit unlucky] then you should be luckier afterwards to balance it out. But in fact, your past behavior [the fact that the Tigers were so unlucky] says nothing about whether or not they will continue to be unlucky. The next five games are just as likely to put us in the unlucky column as the lucky column. Additional reading here: http://en.wikipedia.org/wiki/Gambler%27s_fallacy [section 2 is probably a good place to start]. 3) I took warning of this very principle yesterday when reading about Rembert Browne’s misadventures in Florida. As a postscript, I’ll note that you’re already aware that, when it comes to probability, I’m a conscientious objector, as well as a longstanding member of the Tom Stoppard Fan Club. Max Scherzer became the the first pitcher to start a season 12-0 since Roger Clemens did the same for the Red Sox in 1986, pitching the Detroit Tigers to a 6-3 victory over the Tampa Bay Rays. But reaching 12-0 wasn’t his only MLB milestone. In striking out nine, Scherzer is the only pitcher in MLB history to go unbeaten in his first sixteen starts with at least 120 strikeouts. His streak of consecutive six-plus strikeout games reached 16 games as well. More on last night’s win over the D-Rays here.